Ricotta is a soft creamy but slightly grainy cheese, white in colour with a hint of sweetness to its flavour. Ricotta means “recooked” and is derived from the fact that the cheese is made by heating the whey (a by-product of cheese making) from another cheese such as mozzarella. Ricotta is a versatile cheese and can be used in savoury and sweet dishes. This home-made version may not be authentically Italian, but is really delicious, easy to make and a great introduction to cheese making. Simple ingredients used and no specialized equipment needed. So before you reach for the tub of Ricotta give this recipe a try… you might get hooked! How to make: Pour the milk and cream into a saucepan, add the sea salt. Over a medium heat and stirring with a wooden spoon bring the liquid to almost boiling point. Remove the saucepan from the heat and stir in the lemon juice. Almost immediately the liquid will begin to curdle, leave un-disturbed for 5 minutes. If you are using cheesecloth instead of a straining bag make sure you have a piece large enough that you can double over if you need too, my straining bag has a very fine mesh so I found that worked for me. How quickly the whey drains from the curds depends on the weave in the cheesecloth, so keep that in mind. Good quality white kitchen paper towels (no coloured designs) could be used instead of the cheesecloth. Place the sieve over a heat-proof bowl lined with the cheesecloth/straining bag and spoon the curdled liquid into the center. I like to strain the cheese for about an hour, as the longer you leave the cheese to strain the firmer its consistency will be. If you prefer a softer cheese strain for a shorter time, the cheese will firm up more when refrigerated. Once the whey has been drained from the curds, discard the whey (could be used in bread making) and place the Ricotta cheese into an airtight container and refrigerate until needed. The Ricotta cheese will keep for about 3 days. I sometimes double the recipe if I find that I need a larger quantity. This recipe will give you about one cup of Ricotta cheese. How to make: Preheat the oven grill to high and lightly toast the french bread slices on each side. Rub the cut side of the garlic over one side of each piece of toasted bread. 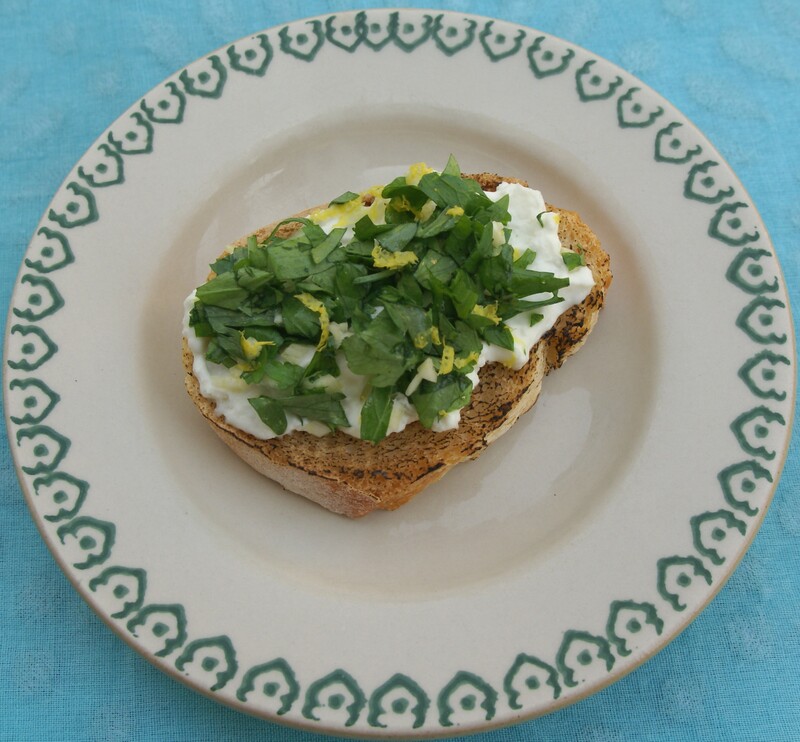 Spread the cooled slices of french bread with some Ricotta cheese and then garnish each slice with some prepared Gremolata and serve. Hi Kenzie, I will post a recipe for you soon. sounds delicious and simple! i can’t wait to try this one!